Northern Arizona University’s Cline Library invites applications for the 2019 Elizabeth M. and P.T. Reilly Internship. The 2019 Reilly intern will work closely with Special Collections and Archives (SCA) staff to develop physical and virtual exhibits that celebrate the life, work, and experiences of Katie Lee. 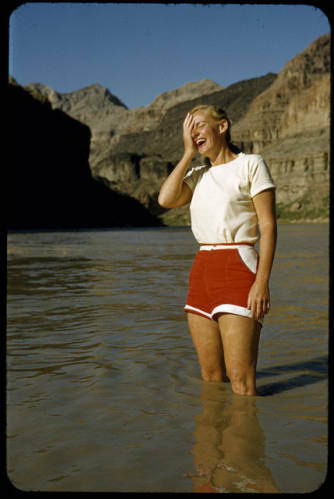 Lee (1919-2017) was a Hollywood actress, folk singer, river runner, writer, ardent advocate for the preservation of Glen Canyon, and a vociferous champion of the sensuous and unique beauty of the Southwest. The Reilly intern will draw on SCA’s vast and rich resources to develop exhibits that reflect the spirit, passion, and independence with which Katie Lee lived her life. 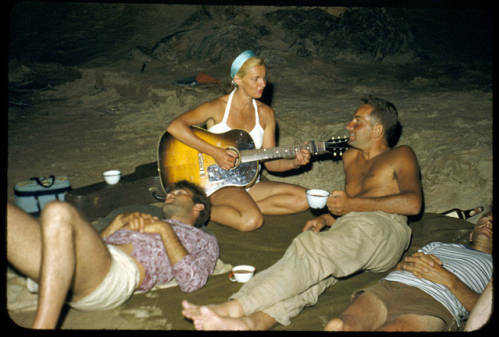 To learn more about Lee, see the finding guide to her collection, a selection of digitized items from her collection, and Beth and George Gage’s short documentary film Kickass Katie Lee. 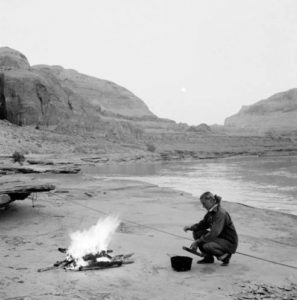 SCA envisions the exhibits as a retrospective examination of Katie Lee’s life that celebrates her love for the Southwest and Glen Canyon. 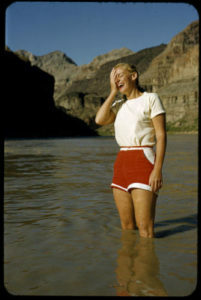 The intern will explore and synthesize the various aspects of Lee’s life to tell the story of a woman who witnessed her beloved Glen Canyon buried beneath Lake Powell, an experience that fueled an indefatigable drive to oppose future dams, ensure that rivers flow freely, and to protect the Southwest canyonlands and deserts. The successful intern will get to know Katie Lee and her relationship with the Southwest and share her life and experiences with the world through the exhibit. SCA contains one of the most comprehensive collections of Grand Canyon and Colorado Plateau history in the world. More than 700 collections containing millions of photographs, correspondence, journals, maps, films, and oral histories that document the human and natural history of the Colorado Plateau from a variety of perspectives from the 19th century to the present. Duties and Opportunities: The 2019 Reilly intern will assume primary responsibility for the virtual exhibit (web-based, developed using WordPress). The intern will also provide significant support for the development of the physical exhibit, from its interpretive text to its design and fabrication. The Reilly intern will work 40 hours per week for 10 consecutive weeks. The successful candidate will select a 10-week block between May 13 – August 16, 2019. The workweek schedule offers some flexibility. Stipend and Housing: $4,500 (no benefits included) total. The Reilly intern will be paid in bi-weekly installments to reach the total of $4,500. On-campus housing is subject to availability. For more information, please consult https://nau.edu/Residence-Life/Housing-Options/Summer-Housing/. Renting a room in the community is also a possibility. The successful candidate must be willing to relocate to Flagstaff for 10 weeks and underwrite his or her own food, lodging, transportation to work, and parking. Qualifications: The preferred candidate will be a highly motivated and organized student in information science, museum studies, history, or related field working toward a career in a library, museum, or archives setting. Graduate students need to be currently enrolled in an accredited program with an anticipated completion date of August/September 2019 or later. Undergraduate (junior or senior) students studying applied indigenous studies, geography, history, environmental history, anthropology, or other appropriate areasare also encouraged to apply. A 250-word writing sample. Prompt: Tell us about a person or place that has inspired you. For more information, contact Peter Runge via email at peter.runge@nau.edu or phone at (928) 523-6502. Flagstaff has a population of about 70,000, rich in cultural diversity. Located at the base of the majestic San Francisco Peaks, Flagstaff is 140 miles north of Phoenix at intersection of Interstate 17 and Interstate 40. The university is committed to a diverse and civil working and learning environment. All qualified candidates are encouraged to apply.